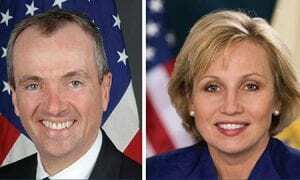 On Tuesday, June 13, Republican Kim Guadagno and Democrat Phil Murphy will kick off their general election campaigns for Governor before an audience of more than 200 business leaders at NJBIA’s Employer Legislative Committees Gubernatorial Reception. The event will run from 6 p.m. to 9 p.m., June 13 at Hamilton Manor in Hamilton. Both candidates have confirmed their attendance. The NJBIA ELC Gubernatorial Reception is traditionally the first major general campaign event following the primary election and offers the newly chosen Democratic and Republican gubernatorial nominees the chance to address the state’s business leaders. NJBIA President and CEO Michele Siekerka thanked Guadagno and Murphy for recognizing the importance of the business community’s concerns through their participation in this event. “Now that the primary is over and the nominees are chosen, we want to make sure the economy gets the attention it deserves in the gubernatorial campaign,” Siekerka said. “NJBIA members tell us they are looking for our next Governor to enhance the climate for job growth and affordability. The Employer Legislative Committees have been NJBIA’s grassroots affiliates since 1959. Each ELC is independently run, bringing together local businesses with the legislators and government officials for informal monthly meetings. “These are the business people who stay active in the political process day in and day out, so it makes sense for them to be part of the kickoff of the general election campaign,” said ELC Executive Director Frank Robinson. Members of the media who wish to cover the event should contact Joanne Degnan at 609-858-9494 or jdegnan@njbia.org.